Some people drink particular wines to go with their steak or fish. Not these fans--BB&T Atlanta Open devotees want their wine to complement high level tennis. Cocktails With Leigh hosted a wine tasting for all interested parties. CEO Leigh Catherall had wine connoisseurs sample the delectable refreshments as they mingled, no doubt discussing the results of the day's match lineup. Eager consumers had the chance to discuss tennis, enjoy glasses of Chateau Ste. Michelle and help raise funds to support the noted charity Camp Twin Lakes. Despite a brief heavy rain that doused the site, tennis and wine fans alike wouldn't let the weather rain on their parade. The event was held on the second level of the trendy restaurant STRIP. Cocktails With Leigh provided friends, fun and $5 glasses of wine. When asked about the event, Catherall said, "We're very excited to host the BB&T Atlanta Open. This is our second year in a row hosting the VIP program. We're looking forward to support the tournament all week long." German tennis player Michael Berrer – who just arrived after making the semifinals in Bogota – was the special guest. Berrer reached a career-high singles ranking of No. 42 in 2010 and recently defeated Rafael Nadal in three sets at the 2015 Qatar Open. 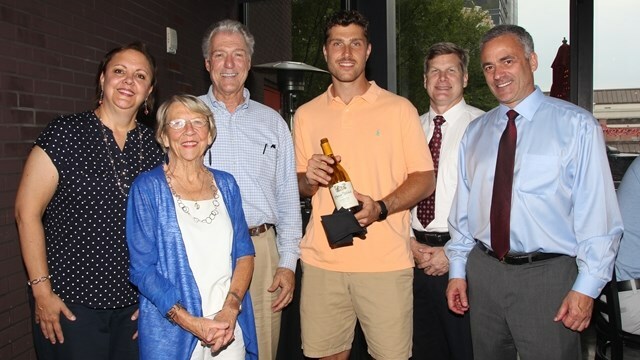 Party attendees were pleased as Berrer served wine and posed for pictures with the guests. Berrer's reaction to Cocktails With Leigh was, "This is a nice event. It's good to meet local people." Then, when asked specifically about the BB&T Atlanta Open, Berrer stated, "I played in this tournament a few years ago . The new facility should be great. The tournament director does a good job hosting us and taking care of us."